The Argentine Military Cemetery, Spanish: Cementerio de Darwin  (Darwin Cemetery), is a military cemetery on East Falkland that holds the remains of 237 Argentine combatants killed during the 1982 Falklands War (Spanish: Guerra de las Malvinas). It is located west of the Darwin Settlement close to the location of the Battle of Goose Green and there is a replica of the cemetery at Berazategui in Buenos Aires Province Argentina. When the war ended on June 14, 1982, most Argentine bodies were left in temporary graves close to where they fell. Britain offered to send them to Buenos Aires, but the ruling military junta said they were already in their homeland. In December 1982 the British government commissioned a firm of civilian undertakers under the command of British Army Colonel Geoffrey Cardozo, to consolidate all the temporary Argentine graves on the Islands to a single location. Assisted by the armed forces, they identified and documented each Argentine grave site and brought the bodies to Port Darwin. As at the time this was the largest single Argentine grave site, with the bodies of the 47 Argentine soldiers, killed at the Battle of Goose Green and buried there soon after the battle. Many of the bodies collected were without dog-tags, so best efforts were made to identify each soldier from personal effects found on the body. Single items were not considered conclusive, but collections were. All were given a Christian burial with full military honours. Each grave is marked by a white wooden cross with the name of the soldier on it if known or Soldado Argentino Solo Conocido Por Dios ("Argentine Soldier Known Only By God") if not. There is also a common grave on Pebble Island containing the 5 crewman of a T-24 Learjet, belonging to Fenix Squadron shot down by a surface-air missile from HMS Exeter, over Pebble Island on June 7. This grave contains the remains of airman: Comodoro Rodolfo de la Colina, Vicecomodoro Juan Jose Ramon Falconier, Major Marcelo Lotufo, Subof Pr Francisco Tomas Luna and Subof Ay Guido Antonio Marizza. The cemetery is protected by a walled enclosure with a cenotaph including an image of Argentina's patron saint, the Virgen del Lujan. 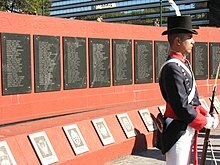 Surrounding the graves, the names of the 649 Argentine soldiers, sailors and airmen who lost their lives in the conflict, are inscribed on glass plaques, with no indication of military rank or service, as requested by their families. Capitán Jorge Osvaldo García successfully ejected from his Argentine Skyhawk after being shot down by a Sea Dart surface-to-air missile on May 25 but wasn't recovered from the water. His body was found in a dinghy on Golding Island in 1983. Lt. Giménez, a Pucará pilot, whose body was found in 1986. His burial was attended by his family, the first Argentine relatives to visit the Falklands since the end of the war. Lt Jorge Casco video, another Skyhawk pilot, who crashed in bad weather on South Jason Island and was buried on 7 March 2009. In the case of Lt. Casco, his family requested that his remains be buried on the Falklands even after they were returned to Argentina in July 2008 for DNA testing in order to confirm his identity. On 9 November 2002 Prince Andrew, himself a Falklands War Veteran, visited the Argentine cemetery and laid a wreath. During the visit the Prince said, "I lost friends and colleagues and I know what it must be like for the great many Argentines who have shared the same experience." Since the UK-Argentine joint statement on 14 July 1999 Argentine families are responsible for the cemetery's upkeep and in 2007, Sebastián Socodo, an Argentine married to a Falkland Islander, was employed to do the job of cemetery maintenance. 'Monumento a los Caídos en Malvinas' (Monument for the fallen on the Falkland Islands) in Plaza San Martín, Buenos Aires. In total 649 Argentines were killed during the 74 days of the conflict. The greatest loss of life in the war was in the sinking of the Argentine Navy cruiser ARA General Belgrano, with 321 members of the crew and 2 civilians on board at the time, with most of these going down with her. Navy Capt. Pedro Giachino was KIA during April 2nd invasion in Port Stanley but buried in Mar del Plata at his daughter's request. Army helicopter UH-1H–BF (AE-419) crash near Caleta Olivia in Patagonia on April 30 during a surveillance mission, killing the crew (Lt Marcos Fassio, Sgt Pedro Campos and Corporal Daniel Barros ) and the 7 man patrol on board. Navy Lt Cmdr Carlos María Zubizarreta was killed in Rio Grande, Tierra del Fuego on May 23 when his parachute did not fully open when he ejected from his A-4Q Skyhawk after a tyre burst on landing due to his bombs still being loaded. The plane stopped by itself and did not suffer any damage. In July 2012 the glass casing protecting a figure of Argentina's patron saint, the Virgin of Luján, at the head of the cemetery was smashed with what appeared to be an axe. Argentina presented a formal protest to the British government and informed the United Nations and the International Red Cross. Sebastián Socodo, an Argentinian-Falklander responsible for the cemetery's upkeep, said families were notified and that it was not clear when it occurred or who the perpetrators were. Police in the Falklands held an investigation and the glass casing was repaired. As part of a joint project between the UK, Falkland Islands, Argentine Government and the International Committee of the Red Cross (ICRC), a forensic team exhumed, analyzed and documented the remains in each of the unidentified graves in the Argentine cemetery with this DNA compared to that of surviving family members. The DNA identification project was co-funded by the UK and Argentine Governments as a humanitarian initiative in line with international law. On 13 September 2016 a UK-Argentina Joint Communication both countries expressed their full support for a DNA identification process in respect of all unknown Argentine soldiers buried in the Falkland Islands. The ICRC's multinational 14-member forensic anthropology team began its efforts in June 2017 with samples analyzed in the Argentine Forensic Anthropology Team's laboratory, and scientists in the United Kingdom and Spain confirmed the results of the DNA testing. As of March 2018 the identity of ninety bodies has been confirmed and more than 200 relatives of these soldiers were able to visit the actual grave for the first time. . On March 26 2018 Argentina’s Secretary for Human Rights, Claudio Avruj accompanied the Argentine families, along with retired British Army Colonel Geoffrey Cardozo, who was originally responsible for burying the Argentine dead immediately after the conflict. The visit included a religious ceremony jointly conducted by Auxiliary Bishop of Buenos Aires, Bishop Eguia Segui, and the Right Reverend Abbott Hugh Allan from the United Kingdom. ^ "WordReference, English-Spanish Dictionary. Falklands: the Falklands, las (islas) Malvinas". Wordreference.com. Retrieved 2010-03-15. ^ Peter Snow, Dan Snow (16 July 2008). "1982 Falklands". 20th Century Battlefields. BBC. Retrieved 20 October 2011. After the war the British government offered to return the bodies of the Argentinian dead to Argentina for burial, but their government refused. They said that these islands were part of Argentina, and the bodies would remain here. For the Falkland islanders, these graves are a reminder that Argentina refuses to drop its claim their homeland. ^ Gregory Fremont-Barnes. The Falklands 1982: Ground Operations in the South Atlantic. p. 93. ^ "One of their aircraft is missing". Archived from the original on 7 November 2009. Retrieved 2009-11-09. ^ "UK military honours for Argentine Pilot". Retrieved 2009-11-09. ^ a b Savill, Richard (2002-11-09). "Prince's Falklands tribute to Argentine dead". The Daily Telegraph. London. Retrieved 2009-11-09. ^ "Simple service pays respect to the Argentine dead". Retrieved 2009-11-09. ^ "Love bridges Falklands divide". BBC News. 4 April 2007. Retrieved 12 February 2012. ^ "List of the missing crew". Archived from the original on 2007-05-10. Retrieved 2009-12-11. ^ Evans, Michael (2007-10-05). "Marine killed Argentinian in Falklands war blunder". The Times. London. Retrieved 2010-04-25. ^ "3ra. Escuadrilla Aeronaval de Caza y Ataque". Archived from the original on 2015-05-31. Retrieved 2010-03-04. ^ "Carlos Zubizarreta". Archived from the original on 2009-12-17. Retrieved 2009-12-06. ^ "Love bridges Falklands divide". BBC News. 4 April 2007. Retrieved 2016-01-18. ^ Ross, Alice (25 January 2017). "Falkland Islands police investigate vandalism at war cemetery". The Guardian. This page was last edited on 1 January 2019, at 19:29 (UTC).